It is raining free data under various offers for Reliance Jio subscribers. Earlier the company launched Dhan Dhana Dhan offer that provides lucrative data benefits for a nominal charge and now the company has come up with a free data offer exclusively for Vivo smartphone users in India. All Jio subscribers using a Vivo smartphone are eligible to get complimentary 4G data up to 168 GB if they participate in the Vivo Jio Cricket Mania offer. What Is Vivo Jio Cricket Mania Offer? The Vivo Jio Cricket Mania offer provides users with free data depending upon the performance of their selected cricket team in the IPL 2017. The interesting part about this offer is that you will get the complimentary 4G data whether your team loses or wins the matches. The amount of free data will vary with the success of your team, of course. 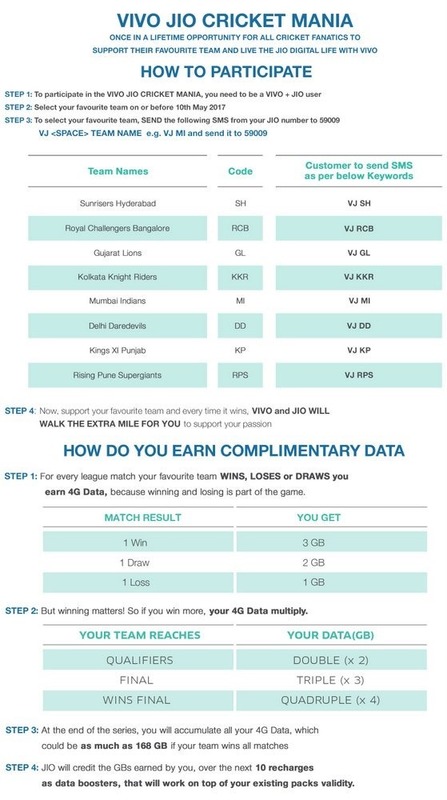 You will be awarded with 3 GB 4G data if your team wins, 2 GB if its draws a match, and 1 GB if it loses a match. So you will get free data in any case. The data benefits will multiply (2x, 3x, and 4x) if your team performs well and reaches the Qualifiers, Finals, and wins the IPL 2017. In the best case, if your team wins all the matches, which is highly unlikely, you will be awarded with 168 GB data. Now considering the worst scenario, which again is unlikely to happen, that is, when your team loses all the matches it plays, you will get 14 GB (14 x 1 GB) 4G data. This is a very good chance for you to get free data from Jio that will be credited to your account as data booster packs over your existing pack starting 1st June 2017, over the next 10 recharges each of Rs. 303 and above ending 31st March 2018. However, in case you recharge with any amount lower than Rs. 303 then you will be disentitled for any free data benefit. For e.g. : Send a message like, “VJ SH” to 59009. We would advise you to choose a team very carefully as you cannot change your selection later. So think rationally and choose the best team to maximize your data benefits. You can select your favourite team any time before 10th May 2017, but those participating after 30th April will have their free data benefits reduced by 50%. Users will also get the accumulated data benefits linked to the performance of their team starting 5th April. “Any Jio user registering prior to 30th April, 2017 will be eligible to accumulate complimentary 4G data arising from the outcome all matches played by the selected team from 5th April 2017 until the end of the first round,” mentioned Jio. This complimentary data benefit is valid only for Jio subscribers on a Vivo smartphone. To ascertain whether the subscriber is on a Vivo phone, Jio will record the IMEI of the user’s phone. Reliance Jio is trying everything it can to attract new and retain its existing subscribers by offering attractive packs and complimentary data under various offers. The Vivo Jio Cricket Mania offer is free to participate in, but it can fetch you tens of GBs of free 4G data. Do let us know your thoughts about this offer? Would you retain your Jio number just for complimentary benefits like this or are more interested in network quality? "Reliance Jio Offers Up To 168 GB Free Data Under ‘Vivo Jio Cricket Mania’ Offer. Here Is How To Get It! ", 5 out of 5 based on 4 ratings.